The 8" X 1-5/8" (200 X 40mm) aluminium oxide Grindstone along with a 5-3/4" X 1" (145 X 26mm) Leather Honing Wheel that operates at 120 RPM. The Grinding Stone and Honing Wheel ride on a Stainless Steel main shaft and stone hardware with EzyLock. Used, works as it should, One wheel has slight dent in it. Water tray has light rust stain which should clean up fine, machine is dusty as found. The T-8's updated design, and other upgraded details, gives you the best conditions possible for a successful sharpening experience, with top results. This feature ensures a 90 degree corner, and also provides the ability to create a cambered shape, if desired. It will handle blades with a minimim length of 3-4", but copes best with blades longer than 160 mm (6-1/4"). You may also be interested in. After grinding, the genuine leather honing wheel gently removes the burr and hones the edge to razor sharpness. Watch two videos on the T-8 at Advanced Machinery: search for Advanced Machinery T-8. The new SE-77 Square Edge Jig, included with the T-8, changes the task of grinding tools square from tricky to foolproof. NO EXCEPTIONS; NO MATTER HOW CLOSE YOU THINK YOU LIVE TO MY LOCATION. The micro adjust function was introduced Aug 2003. Vital functions like the motor and main shaft are mounted in the zinc cast top which also includes the integrated sleeves for the Universal Support. 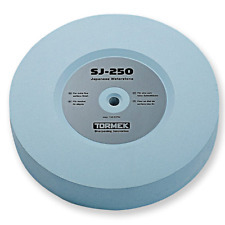 Utilizing a 200mm (8") grinding wheel, the T-4 model now includes the SP-650 Stone graderwhich changes your stone from its 220 grit to a 1000 grit surface and back again. 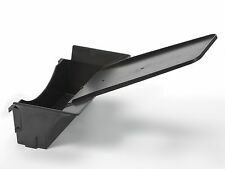 Fitted foam liner is designed as a tool holder and can be mounted to the wall as permanent storage for the accessories. Hand Tool Kit Includes: Knife Jig; Long Knife Jig; Scissors Jig; Axe Jig; and Short Tool Jig. Both the shape and edge angle must be repeated exactly. It enables you to exactly replicate the edge on bowl or spindle gouges as well as flat or oval skews with either a straight or a curved edge. The Turning Tool Setter works as well when setting the edge angle on the leather honing wheel. The fitted foam liner is designed as a tool holder and can be mounted to the wall as permanent storage for the accessories. 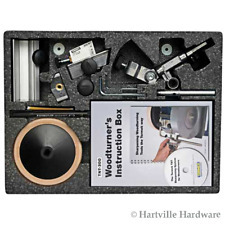 Kit Includes: Gouge & Turning Cutter Jig; Multi-Jig; Tool Rest with Torlock; Profiled Leather Honing Wheel; Machine Cover; Woodturner's Instruction Box (includes instruction book & DVD); and Turning Tool Setter. 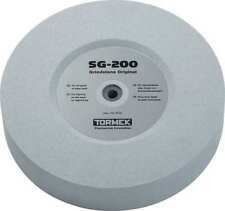 Flanges ensure a 90° positioning of the tools towards the grindstone. Copes with tools down to 45mm (1-3/4") in length, and a maximum width of 32mm (1-1/4"). It has a generous 90 by 110 mm (3-1/2" X 4-1/4") flat surface, which permits a safe and steady positioning of the tool towards the stone. Fast and secure locking on the Universal Support is possible due to the patented design, which increases the locking force by 250%. You get an exact replication of both the shape and edge angle. 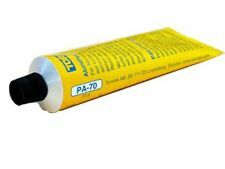 You can also use it for woodcarving tools, such as curved gouges and V-tools. Longer knives need to be stiff to work correctly in the jig. The jig rests freely on the Universal Support so you can follow the curve of the blade. You may also be interested in. Since it is made to create the finest surface, it has a limited steel removal capacity and cannot be used for shaping a tool. This wheel excels at sharpening hand tools like carving tools, knives, scissors, plane irons and wood chisels where a minimum of steel removal is needed and a superior surface finish is demanded. 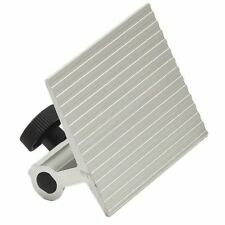 The exact edge angle is set by turning the Adjustable Stop or using the Micro Adjust on the Universal Support. Patent Pending. The Holder Jig consists of a Guide Bar, a Handle Grip, and an Adjustable Clamp. Quickly produce a repeatable razor edge. Can also be used for Bent Carving Gouges and V-Tools. Made for Fingernail Shaped Turning Gouges. 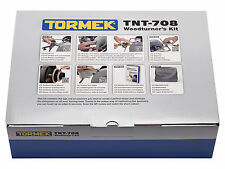 Tormek SVM-45 Knife Jig - Keep your Knives Sharp! Tormek's most popular jig. You adjust the jig to the knife thickness with the screw and lock by tightening the knob. The jig rests on the Universal Support. The exact edge angle is set by rotating the stop or with the Micro Adjust on the Universal Support. 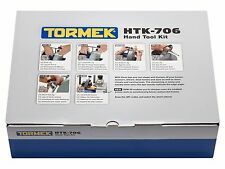 5 out of 5 stars - Tormek SVM-45 Knife Jig - Keep your Knives Sharp! Tormek's most popular jig. 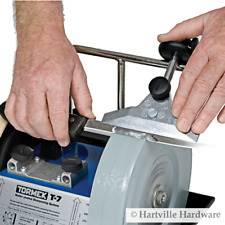 13 product ratings13 product ratings - Tormek SVM-45 Knife Jig - Keep your Knives Sharp! Tormek's most popular jig. With ex­change­able profiles. The wheel mounts outside the standard honing wheel. The two standard discs have a radius of 3 mm (1/8") and a 60º tip. Discs with alternative, narrower profiles are available as optional extras. Add 10 ml concentrate to 250ml of water (@ 4%) for correct dilution. Mix Anti-Corrosion Concentrate and water before adding to water trough. Lower the water trough if you want to save the mix overnight. The grinding depth can be set within 0.1 mm (0.004"). The minimum width of blade that can be used in the jig is 13 mm (1/2"). You may also be interested in. 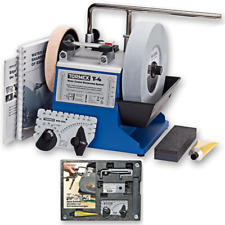 BGM Starter Kit : Includes the BGM-100 Bench Grinder Mounting Set (#86213 - includes sharpening handbook); TTS-100 Turning Tool Setter (#92770); and the SVD-185 Gouge Jig. The design gives you the best conditions for a successful sharpening with the highest precision over the final result. You can also set the jig for a slightly convex shape. The jig's construction also makes it possible to position and sharpen tapered chisels, e.g. Japanese chisels. It has a generous surface, 90×110 mm (3½"×4¼"), which permits a safe and steady positioning of the tool towards the stone. The bore is made with a special wedge shape, which increases the locking force by 250 %. Efficiently cuts all types of tools and steel qualities including HSS. The Stone Grader polishes the surface of the grindstone from its normal 220 grit to a finish that works like a 1000 grit stone. 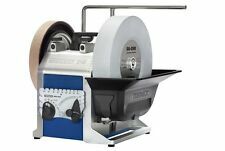 The diamond wheel optimized for knife sharpening combined with an adjustable angle guide makes it easy to achieve professional quality sharpening, right where and when it is needed. 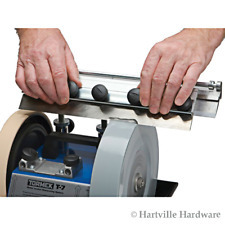 You can sharpen knives 9/16" to 2 7/8" wide with a maximum thickness of 1/8". The Tilt Shoes are placed under the honing wheel side of the machine to raise it so the water follows the tool towards the outside of the stone and runs back into the water trough. The exact edge angle is set by turning the Adjustable Stop or using the Micro Adjust on the Universal Support. Watch the video at Advanced Machinery: search for Advanced Machinery SVM-00. SVM-45 Knife Jig - For most knives. Width 45 mm (1 3/4"). Long knives need to be stiff. Min blade length 60 mm (2 3/8"). Also for carvers draw knives. SVM-140 Long Knife Jig - Suitable for long and flexible knives. Now you can blend the best of both worlds into a convenient, precise, and economical turning tool system. Converter Set : Includes Converter Bracket (#OWC1); Horizontal Base (#XB100); Universal Support (#US105); and Bracket Block. The minimum blade width is 13mm (1/2in.). The jig indexes off of the back edge of the planer blade. The positive stop insures that you grind a perfectly straight edge. Longer blades (even up to 36") require re-positioning, but can be ground to amazing accuracy -- even by a novice operator. It enables you to exactly replicate the edge on bowl or spindle gouges as well as flat or oval skews with either a straight or a curved edge. You do not need to worry about whether you have the right shape. 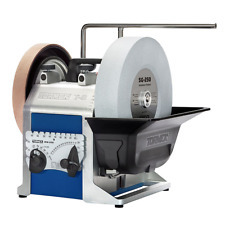 LA-120 Leather Honing Wheel - For honing and polishing the flute on gouges. One with a 3 mm (1/8") radius and one with a 60° point. This base rotates 180 degrees to obtain the ideal sharpening direction and it makes it very easy and simple to switch from sharpening to honing. A precision sharpened 4-facet point generates less heat and the life of the drill is therefore also prolonged. No change of chuck required. The jig will create a 4-facet point, which gives the ideal cutting performance since the chisel edge gets a point instead of being almost flat, as on many drills. Since it is made to create the finest surface, it has a limited steel removal capacity andcannot be used for shaping a tool. On yourAndroid smartphone &tablet search Google Play for "FVB Angle Setter". Our knife sharpening software and gadgets are used in 44 countries. It is made of 12 mm (approx. 1/2") round steel and has a double mounting for maximum stability. The Universal Support incorporates a micro adjust for exact and fast fine setting. The Universal Support can be placed either in the vertical sleeves or in a horizontal base. For convenience it can be mounted either vertically or horizontally.